1. Do I have to order the items by the case ? Answer: The minimum order on some items is one case and 1/2 a case on others .Certain items are packed 24 pcs per case, some are packed 72 pcs per case, therefore the min order will be whatever the case (or half a case) packs, however, you can order 36 pcs 42 pcs 98 pcs etc. You will have to order this over the phone as our shopping cart is set for case and half a case sales only. 2. How long does it take to ship the order ? Answer: Once we receive your order and providing the item is in stock, it takes approximately 24 to 48 hours to process and ship orders (excluding weekends and holidays). Quicker turnaround may be available if you contact us. Certain items such as sheets and blankets which are made per order might take up to 7-10 days to be shipped. 3. Can I mix several colors per case.? Answer: We normally prefer to ship 1 case per color, however for first time buyers or on special occasions we can do 2 colors per case at most. Answer: We will accept any returns that are not used and still in their original poly bags.We do not accept returns or give any refunds on custom embroidery or custom embroidery jobs. The customer will be responsible for shipping costs, we will provide full refund for the merchandise only, if returns were authorized by us and within 30 days of purchase. 5. Who is CottonFruit.com ? are you brokers? agents? Home business? Answer: We are a manufacturer /wholesalers of towels and linen since 2000. We have a large facility in Miami of about 15,000 SQ feet, and we carry a tremendous amount of goods on our floors. We purchase our yarn and then have it produced in the same facilities for the last 7 years. 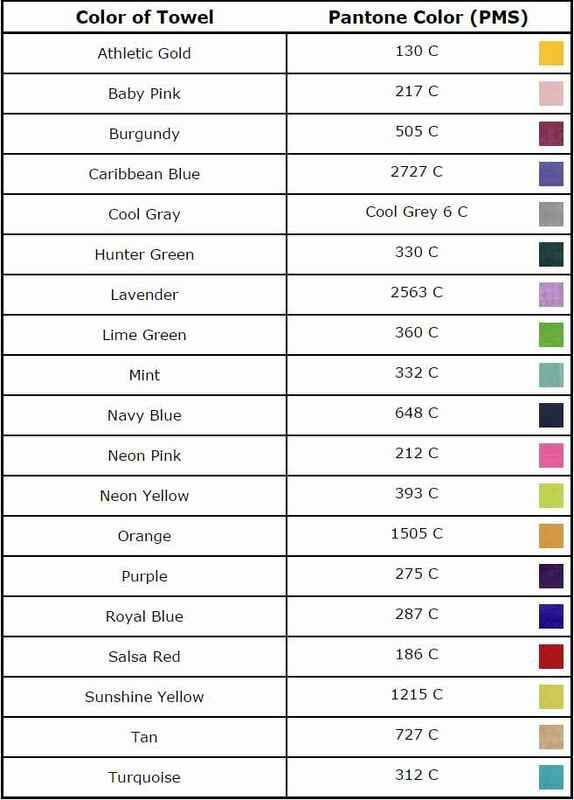 We are probably the only company who stocks over 6000 pcs per color in beach towels at all time, and we make 16 colors!! 6. Who are your customers? Answer: We have over 30,000 customers, and obviously can not name them all, however we supply towels mostly through our distributors to Shell, GE, Whirlpool, Norwegian Cruise lines, Disney High School Musical, Lennar Homes, Bronx Metro zoo, Xerox, HP, Memorial Hospitals, Marriot, Hilton, Seminole Hard Rock Cafe, and yes Shamoo the whale who eats his fish right off our hand towels at the SeaWorld. 7. What is the difference between embroidery and silkscreen? Answer: Embroidery now days is a more popular method of personalizing your towels or robes, the customers know there is more work done using embroidery and appreciate the detail and time it takes to do each towel. Embroidery has the advantage of lower cost for set up, especially when several colors are involved, and you can order as little as 24 pcs. For silkscreen the minimum order is much larger, and the process is faster where ink is pressed onto the towel, so it is a cheaper process and does cost less than embroidery. 8. embroidery is stitched on the towel therefore faces, scenery, and other photo like images will not come out as clear as a picture. Embroidery is great for logos, and outlined designs. 9. We place the embroidery on the bottom center of the towel, about 8-10 inches from the bottom hem. Embroidery does not feel great on your skin, and having it placed on the bottom center will put it in the most visible place on the towel at all time. Unless requested by the customer, bottom center is the default placement for the embroidery design. 10. Since embroidered towels are custom towels there is no refund or exchange on custom towels, please make sure you approve the logo, and sign the invoice. 12. We can do a pantone color match if we have it on the shelf,if not requested we will use our closest thread color available. If you want to match a specific Pantone color, please indicate it when placing your order,if order is large enough we can order the threads specifically for your order, on small order, a fee will be charged to order the special thread.